In a move that came fast on the heels of both major Japanese airlines – JAL and ANA – grounding their Boeing 787 fleets, the Federal Aviation Administration has ordered the temporary grounding of US-based Boeing 787 aircraft. At this time, the only US airline operating the aircraft is United, which immediately grounded its six 787’s, as did Air India late Wednesday. After an emergency landing Wednesday, ANA grounded all 17 of its 787’s. Japan’s two largest carriers, ANA and Japan Airlines are also grounding the 787 aircraft after an emergency landing of one of ANA’s jets Wednesday during which the smoke alarms went off indicating a possible emergency and exposing a battery fire risk. Following the incident, ANA grounded all 17 of its 787’s and JAL temporarily grounded its fleet voluntarily until at least Thursday (today) as well. The two carriers operate 24 of the 50 Dreamliners delivered by Boeing to date and US air-safety regulators are dispatching an investigator to Japan immediately. ANA said instruments on domestic flight 692 from Yamaguchi to Tokyo Haneda indicated a battery error about 40 minutes into the flight, triggering emergency warnings to the pilots. The carrier said the battery was the same type as one that caused a fire on another Dreamliner at a U.S. airport last week. The plane was diverted to Takamatsu airport and all 129 passengers and eight crew were evacuated safely with the aircraft’s inflatable slides. We had a nice time during the Star Megado but all planes go through growing pains. The incident is only the most recent of many that have plagued the Dreamliner’s extenuated and ever-delayed development process, and many of them seem to involve the advanced aircraft’s batteries and electrical systems, so that’s where the investigation will focus. Just recently on January 7, one of JAL’s 787’s had a battery fire while on the ground at Boston Logan airport, leading many experts to speculate that the plane’s next-generation electrical system and much-touted lithium batteries have some serious problems at heart that will need to be resolved before these planes can start operating on the vast commercial scale for which many airlines with orders of them have planned. Although all new aircrafts face glitches that appear during flight-testing and actual flights – the A380 continues to worry some experts, especially after an incident with a Qantas jet last year that had an engine explode while in flight – but the continual problems that have plagued the 787 as well as the two Japanese carriers’ and the FAA’s swift and sweeping actions might be an indication that the 787 is headed for a turbulent road ahead, not only in the skies, but in the perception of flyers who might opt to take other aircraft when possible and cut into the bottom lines of airlines that operate the plane. 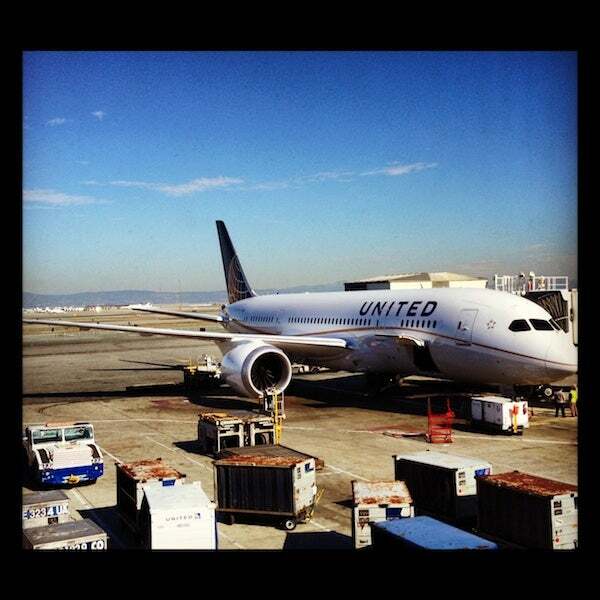 I was able to fly on one of United’s 787 Dreamliners during the Star Megado in November, and enjoyed the plane’s sleek, airy interior, quiet flight operation and overall comfort factor. I’m hoping that Boeing and regulators can work out the issues in the near future so that more airlines can put the aircraft into service and I can fly it on one of the long-haul routes for which it was designed. Until then it looks like I (and all of us) will have to stick to 777’s, A340’s and A380’s. LOT Polish Airlines SA said its inaugural 787 flight from Warsaw to Chicago took off as planned and Qantas still plans to take deliver of the first of its 787’s later this year – hopefully these issues will be resolved by then! If you’re scheduled to fly on a 787 in the near future, be sure to double and triple check your itinerary with the airline and keep up on whether there are any flight cancellations. If your flight is changed or rescheduled with a different aircraft, make sure you have a seat assignment that’s equivalent to your former one since you don’t want to inadvertently get stuck in a middle after already having staked out your aisle or window on the original flight. You should not be charged to change your flight if the schedule impact is significant (the definition of that varies by airline) and I’m sure most airline reservations are able to make any reasonable changes to your itinerary. Even after the 787s are back in service, you may still be able to switch flights if you aren’t comfortable flying the aircraft- it never hurts to ask!